Inventory We are a resale marketplace, not a box office or venue. Ticket prices may exceed face value. This site is not owned by Mayo Civic Center . The Mayo Civic Center opened in 1938 and currently has two main venues for shows and performances. Taylor Arena has a seating capacity of 7,200 and The Auditorium can seat 3,000. Over the years the facility has gone through a myriad of renovations and remodels. 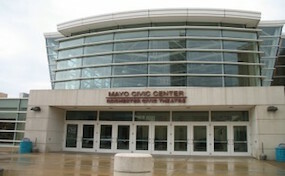 The Mayo Civic Center box office is located at 30 Civic Center Dr SE in downtown Rochester, MN. The Auditorium is reserved mainly for more intimate shows and traveling Broadway plays, whereas the Arena has many big production shows and concerts like Bon Jovi, Bob Dylan, KISS, and the WWE. CenterRochester.com is a privately owned and operated company that operates solely in the online secondary resale marketplace. We have no affiliations with primary vendors, official websites, and or any box office. Prices on our sites may be well above face value and can change quickly with market conditions. To order tickets online for all Mayo Civic Center Rochester events please follow the steps through the checkout.